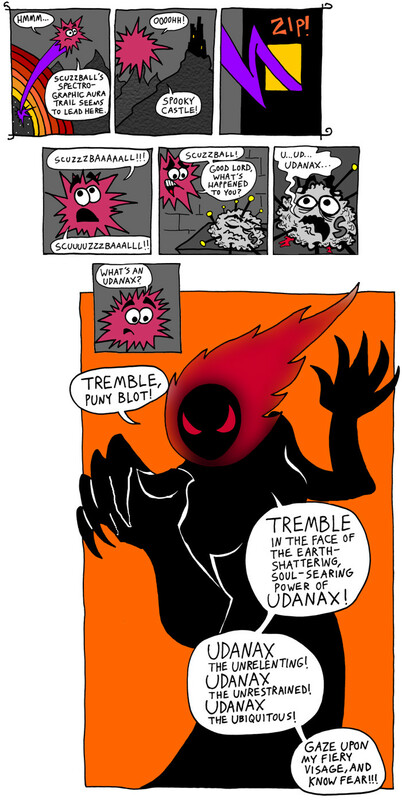 Fuzzball & Scuzzball - TREMBLE, Puny Blot! Comic 147 - TREMBLE, Puny Blot! Most of the time when I've done webcomics--like Laser Brigade or M.A.R.s--the idea has been to serialize it, hopefully get people to read it, and eventually print it. The web is just a step in the process. When I made this comic, though, I decided I wanted to take advantage of the medium and make a webcomic that existed solely to be a webcomic. So this strip could not fit comfortably on a page, and I have no idea how you would print it. Be here on Monday for the thrilling showdown between Space Blot and Udanax! You cannot miss it!! !